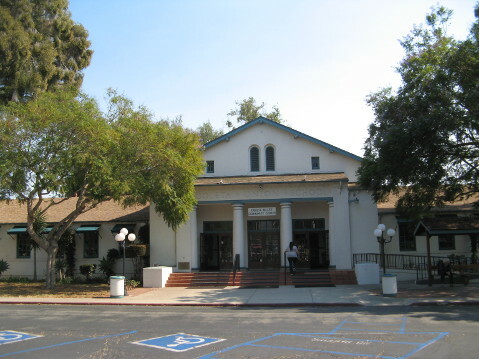 Now the community center for Goleta, this building held Goleta Union School in the city's earliest days. The City of Goleta is pretty spread out between Patterson Avenue and Winchester Canyon, divided down the middle by the 101 freeway. But ask any Goletan where downtown Goleta is, and the answer invariably is Old Town. While it is home to about 5,000 people, a number being old-time residents, Old Town is not the center of the population of the city. A study a few years ago showed that over 50 percent of the population of the city live west of Storke Road. Yet even with the Camino Real Marketplace, Girsh Park, and Ice in Paradise rink, there is no sense of this being the center of the city. What is it that makes Old Town “downtown”? A combination of history and geography. Old Town grew up along the railroad, which served the needs of a rich agricultural area and transported produce to cities across the state and the U.S. It lay in flat land, a flood plain, as became frequently apparent after heavy rains. There was a station at the end of Kellogg, and a group of industries serving trucks and warehouses grew up in this area. With industry came people and houses for them to live in, stores for shopping, and eventually a school in what is now the Goleta Valley Community Center. More jobs developed south of Hollister. Barbershops, hair salons, clothing stores, and other amenities developed along the north side. Old Town developed around the needs of an essentially pedestrian community. The differences from the other residential areas of Goleta — Ellwood, El Encanto Heights, Fairview Avenue, Calle Real — lie in that these areas developed first as housing, bedroom developments; they were not coordinated with job sites and were car dependent. There are major shopping centers, such as the Camino Real Marketplace and the Calle Real Center, but except for the immediate neighborhoods, they are designed for access by cars, not pedestrians. It is interesting that the latest big residential development, Hollister Village, is concurrently building a shopping center, with a grocery store, pharmacy, hair salon, and other amenities, making it more than simply a residential development. The purpose was in part to reduce car traffic, greenhouse gas emissions, and other negative environmental impacts. But it also helps build a community of people with close access to their daily needs. What came naturally with the growth of Old Town, now comes about by design, so-called smart growth, with housing being built near worksites and transportation corridors. Hollister Village, Villages at Los Carneros, and Cortona Apartments bear witness to this policy. 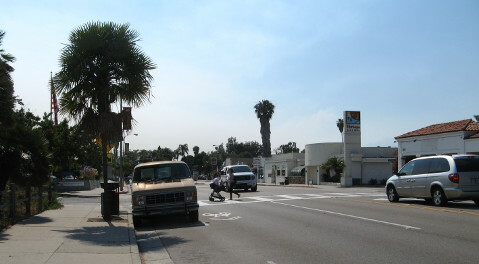 So Goleta Old Town feels more embedded than the more recent housing and worksites, and it also suffers from some disadvantages of being “old.” It lacks sidewalks through much of the older residential areas, though the city is taking steps to remedy this. There are many children who live here, but there are very few parks — a pocket park on Nectarine, a larger one on Armitos, and a four-acre, active-recreation park on Kellogg, which is still being developed. The Boys and Girls Club lies behind the Community Center and is a hub for youth programs. In addition, the Community Center has many offerings for all ages, from Head Start to senior lunches and other programs. The center also is the site of many meetings on topics such as homelessness, land use planning, and many other community issues. There remain many challenges. Hollister Avenue, which was once part of U.S. 101, is a four-lane highway going through the center of Old Town and, we are told, is such an important arterial that it cannot be reduced to two lanes. It is not very safe for bicyclists or pedestrians, but the city is adding more visible crosswalks and traffic lights. Another hazard for Old Town is that it is built on a low-lying area that was once part of the Goleta Slough. It used to flood regularly. A major flood control project on San Jose Creek has now been completed which has increased protection from a 25-year to a 100-year storm event. This should remove 200 parcels in Old Town from the flood plain. The engineers had hoped that El Niño would test it this year but it will now have to wait for another season! Plans were made last year for moving City Hall to Old Town in new construction behind the Community Center. That plan has been shelved for the moment because of cost. At the time I did not support this move, but in thinking about it some more and in researching this article, I have come to agree with an early report by RBF Consulting: “Goleta Old Town is a real downtown. It includes a mix of uses that serves the community and a range of architecture that reflects varying points of the community’s history. 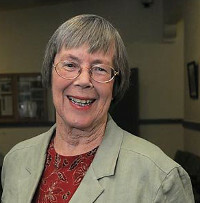 It is and always should be Goleta Old Town.” Putting City Hall there could be a crowning touch.